Before the month is overtaken with the preparation of cookies, cakes, candied nuts, chutneys, jam, and other homemade gifts, I’m taking a week or two to settle into simple, wholesome, comforting food. I’ve just wrapped up my final month of testing recipes for the new cookbook, and exciting as it all has been, I’ve never been more ready to take a step back from the kitchen. 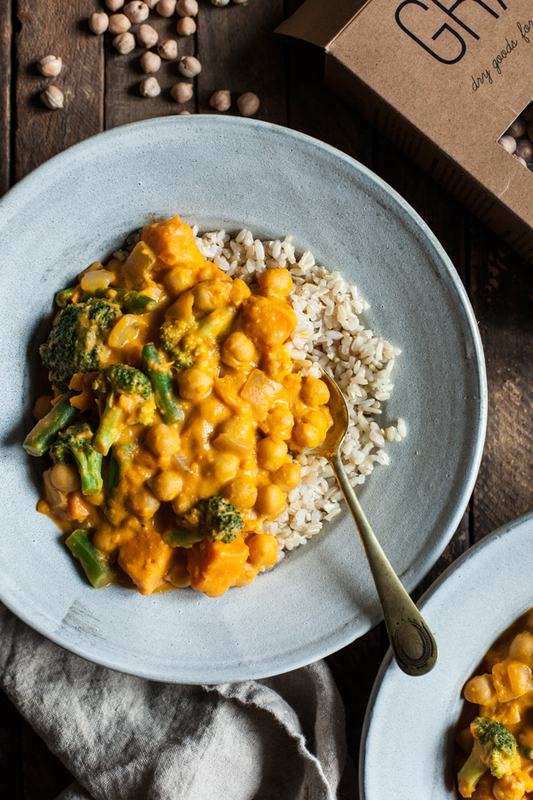 I’ll be making a lot of easy soups and stews over the course of the next month, beginning with this easy pumpkin chickpea cashew curry. This recipe also marks my return to something resembling a normal batch cooking routine. I’ve lost touch with consistent meal planning and batch cooking lately; with all of the recipe testing at hand, my cooking patterns have become totally erratic. I’m looking forward to getting back into a groove: planning, grocery shopping, taking the time to put pots of grains and legumes on the stovetop each Sunday. I made a decision that recipes in the next cookbook would always call for cooked legumes in multiples of 1 1/2 cups, so that the quantities could be easily translated into cans. Canned legumes are a lifesaver for the busy home cook! With that said, I do stand by the idea that there’s a lot to be said for soaking and boiling legumes from scratch. Is it necessary? Nope. But it usually means that beans hold their shape better than they would from the can, and it can also means that herbs, seasonings, and other recipe components can be added to the cooking process, resulting in more flavorful beans. Plus, batch cooked beans can be frozen, making them easily accessible if you’d like to store them for future recipes. 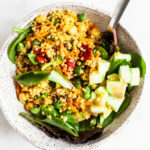 This approach to batch cooking is shared by the folks at GRAIN, a dry goods supply company that’s working to foster more personal connections between consumers and farmers. Founded best friends Shira McDermott (author of the wonderful In Pursuit of More blog) and Janna Bishop, GRAIN brings freshly milled, farm-direct wheat berries, farro, French lentils, laird green lentils, kabuli chickpeas, and golden quinoa directly to customers on their website. The products are always sourced directly from Canadian farmers with full transparency. The packaging, which is strikingly thoughtful, features an original illustration of the farmer who grew the product. 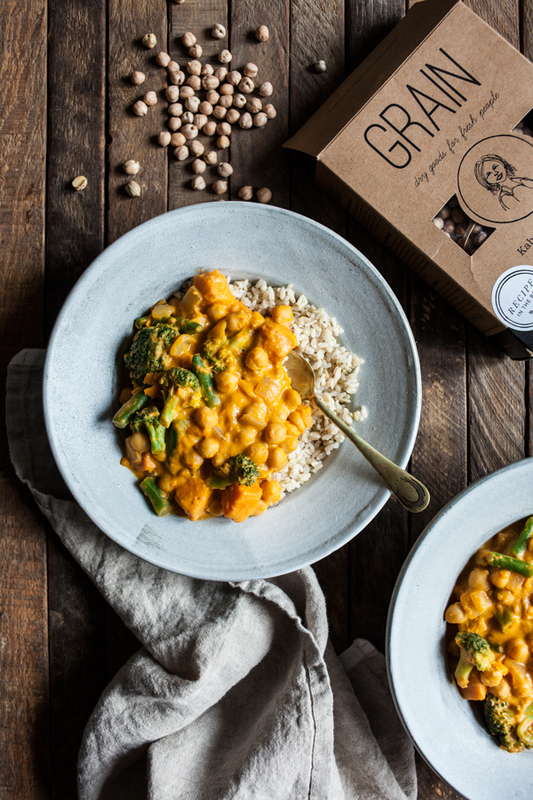 GRAIN’s mission is to deliver the best quality dry goods possible, but it encompasses an entire ethos around food and cooking. The GRAIN shop features mills and bread baskets for homemade bread making, and each GRAIN product is shipped with an inspiring, easy-to-follow recipe card. Shira and Janna are passionate about empowering the home cook to feel more connected to food and its origins. 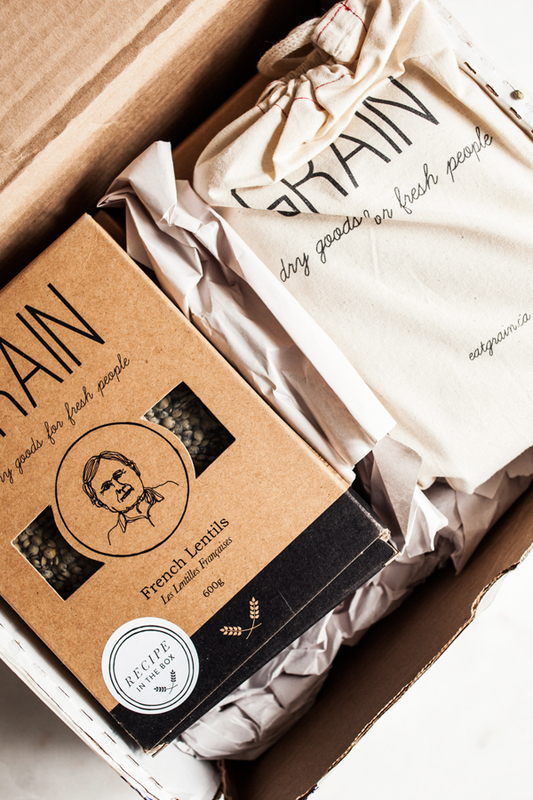 GRAIN products come with a story, and they represent an effort to celebrate and honor Canadian farming. Canada is celebrated the world over for its hard spring wheat in particular, but also its chickpeas and lentils, the majority of which are shipped abroad. Shira and Janna are interested in helping a new generation of North Americans to discover legumes and grains from this “bread basket” of the world–and to encourage the next generation of farmers to continue their work. I eat chickpeas nearly everyday, so you’d think I couldn’t possibly be surprised by a new chickpea product. But GRAIN’s promise of exceptional freshness proved to be true: there wasn’t a stale or shriveled bean in my entire box of kabuli chickpeas, and when I cooked them, they were all brightly colored, plump, and firmly shaped. They’re truly delicious, and it has been so fun creating a recipe with them. 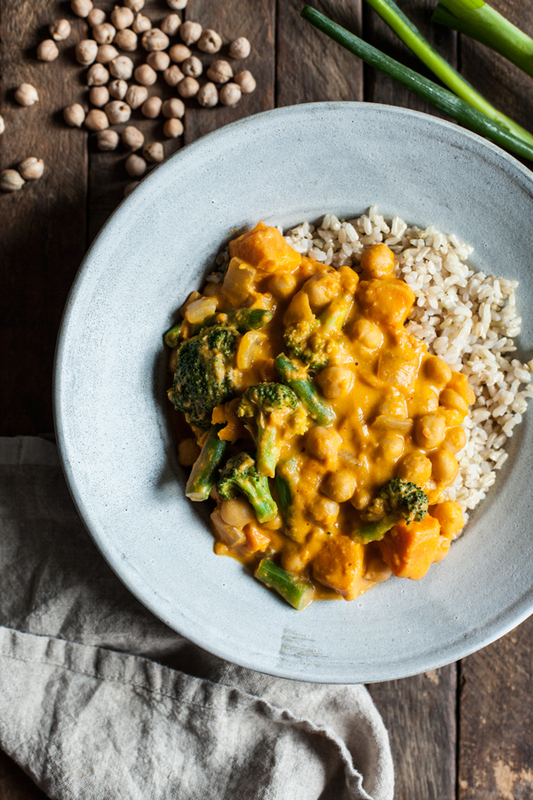 This pumpkin chickpea cashew curry is a perfect example of how an entirely satisfying meal can come together quickly with just one batch-cooked legume as a base. Cashews are blended with pumpkin puree and red curry paste to create a rich, creamy, flavorful sauce, then mixed with sautéed onions, sweet potato, and (of course!) pre-cooked chickpeas. It’s a perfect dish to serve with rice, quinoa, millet, or bulgur, along with fresh herbs and a generous squeeze of extra lime juice. Place one cup of the vegetable broth, the pumpkin, cashews, tamari, lime juice, and curry paste into a blender. Blend till smooth and set this sauce aside. Heat the oil in a pot over medium heat. Add the onion and cook for 5 minutes, stirring frequently, or until the onion is soft and clear. Stir in the garlic and ginger. Cook, stirring constantly, for another minute, or until the garlic is very fragrant. Add the sweet potato to the skillet, along with the additional cup vegetable broth. Cover and simmer for 6-7 minutes, or until the potato is just fork tender. Add the broccoli and green beans, cover, and simmer for another 2-3 minutes, or until the broccoli is tender. 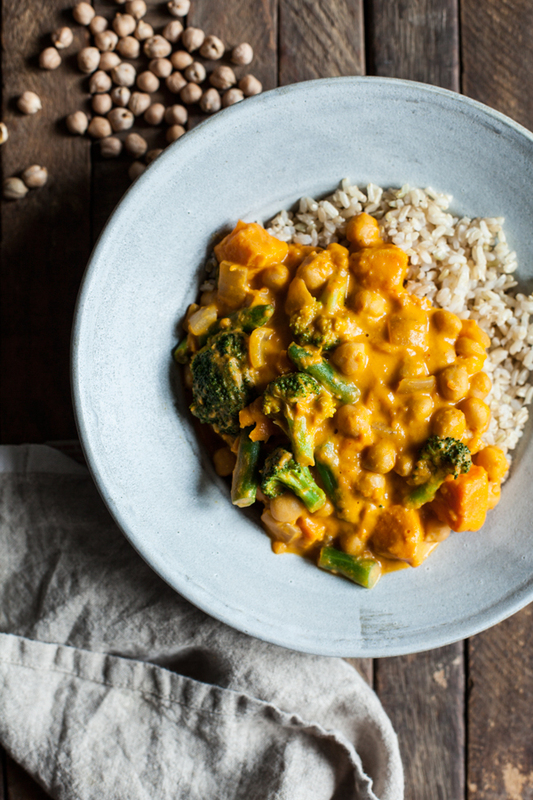 Stir in the chickpeas, then the pumpkin cashew curry sauce. Stir; if the mixture seems too thick, feel free to add extra vegetable broth as needed. Stir in the lime juice, then taste the curry and adjust seasonings as needed. Serve the curry with a cooked grain of choice, lime wedges, and herbs, if desired. Leftover curry will keep for up to 5 days in an airtight container in the fridge. It can be frozen for up to 3 weeks. This is one of those recipes that begs for your own modifications and twists. Try butternut, kabocha, or delicata squash in place of sweet potato, zucchini or eggplant in place of broccoli and green beans. Stir in a few generous handfuls of spinach, bok choy, chopped collards, or another leafy green to add even more fiber and minerals to the meal. What matters is adjusting the seasonings to your liking, blending up a creamy sauce, and, of course, having some quality legumes at the ready. If you’d like to try GRAIN products for yourself, you are in luck: the company is offering free shipping on its products (not the household appliances) to all US and Canadian readers until December 5th. And if that doesn’t pique your interest, GRAIN is also offering 15% off all orders to readers of this blog. Simply enter the coupon code FULLHELPING15 at checkout! In the meantime, if you’d like to get to know the brand and its founders a little better, you can check out the GRAIN journal, which features wonderful recipes, or check out the company’s inspiring Instagram page. I’ll be getting to know GRAIN products better in 2017, and sharing more of the recipes I create with them here on the blog. A happy Wednesday to you all–it’s been pouring here in New York, which may be my invitation to stay in and get some batch cooking done! This post is sponsored by GRAIN. All opinions are my own, and I love these exceptional dry goods! Thank you for your support. This looks amazing! I need to get my hands on red curry paste so I can try this stat! 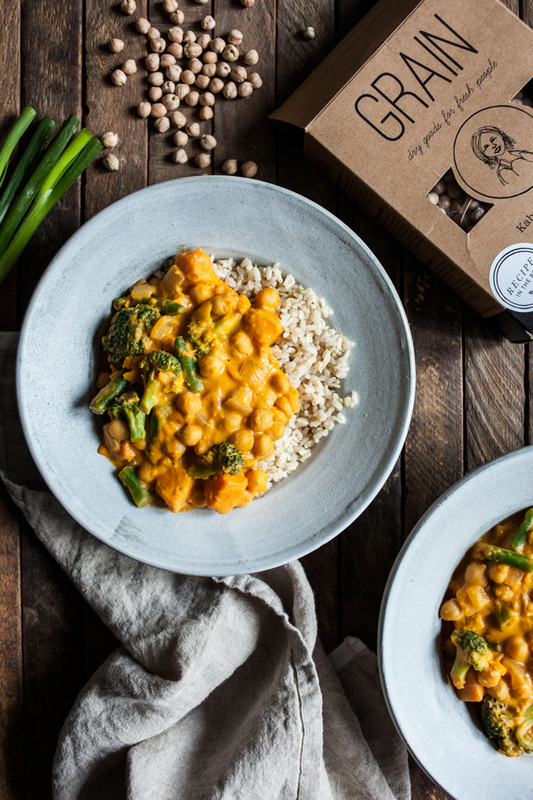 So much goodness in this curry … thank you! What brand red curry paste to you use? I like the Thai Kitchen brand, for the most part. Gena! I made this dish tonight. Oh my YUM! I followed the recipe as written except for subbing 2 TBS curry powder + 2 tsp Turmeric for the curry paste. I saw a small red jar in my fridge before picking up groceries, came home to make the recipe, and realized I had Red CHILI paste, not curry on hand, so I opted for more Indian flavors than Thai. I added an additional 1/2 cup of broth, as the starches from the pumpkin and sweet potato thickened the sauce nicely. I used frozen broccoli florets and green beans to save some money and chopping. All in all, VERY delicious and warming, especially for this Minnesota gal. I plan to keep leftovers on hand for lunches this week.